Description: This moderately challenging course is located next to a beautiful lake with trees and palmettos coming into play on most holes. The course layout, with its many different pin locations allows players the opportunity to throw a variety of different shots. In fact, the course offers an equal number of Hyzer and Anhyzer shots which will test both right and left handed players. Five holes are adjacent to the lake so penalty shots or a lost disc are not uncommon. Every hole has visually stunning tee signs, along with player benches, and bag racks. You’ll even find several shoe brushes on the course, and the local club keeps the course very clean. Local Directions: Go west from US 19 on East Bay Drive. Then turn right and head south on Clearwater Largo Road. Turn right again onto 8th Avenue S.W.S. then proceed approximately a quarter mile. The park will be located on the left. 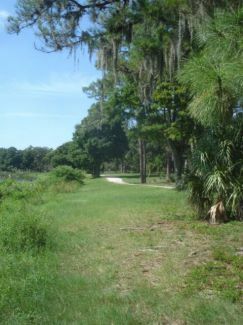 The disc golf course is at the end of the main park road on the opposite side of the lake. Contact Mark Bailey at 727-560-8079, for more information.